2/8/2019: Hotel information and booking links will be posted soon. 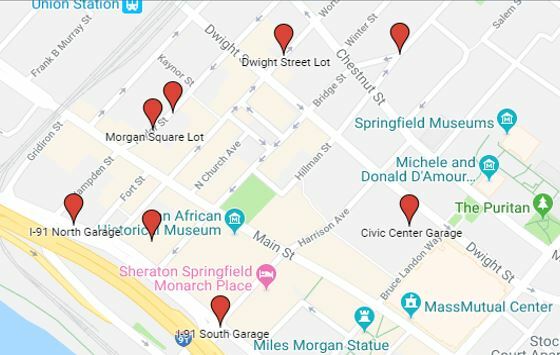 MassDems will have room blocks at several local hotels for you to choose from. Parking is available in the Civic Center Parking Garage located on Bruce Landon Way for $8. Accessible parking is located on the first floor and there is an elevator. Free parking is available at MGM Springfield, One MGM Way, Springfield, MA 01103. There is accessible parking located throughout the facility, EV charging stations and an elevator. All metered spots will be free on Saturday only. Additional parking garages are indicated on the map below. If you are unable to view or access this map, please contact our office at 617-939-0800 for assistance. Bus schedules are still being finalized. Please check back here for additional updates. Acela schedule as of 11/12/2018.